These sound Fab...and oh so yummy! Would love you to share at my food fight! 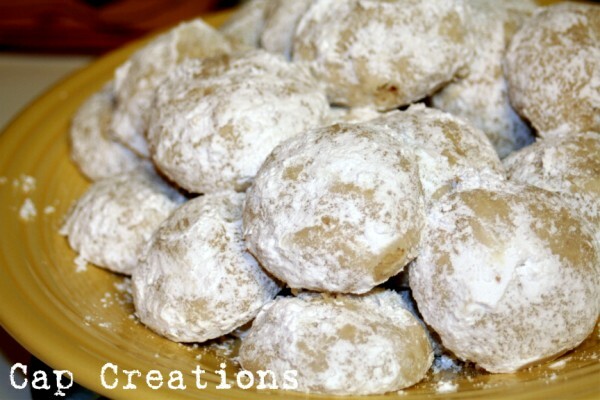 I love these cookies...try with just pecans or just almonds for a change. Just awesome! These look simple and delish! @ Ethnic Girl Fun - Oh I have done the pecans!!! Yum!!! I'll have to try the almonds for sure! yummy. I love your blog header. I love these cookies, my Mom used to make these when I was little. Makes me want to make a batch just for the memories. Thanks! I am happy you gave us the recipe as it sounds so good and your cookies look yummy. I am wondering if they are like my mom's Sand Tarts. Lots of memories here. 36 years ago I made dozens of these for my wedding reception. I piped a pink flower on top of each one. They are still one of my favorite cookies. I a new GFC follower from The Girl Creative. I love Mexican Wedding Cookies. My husband loves them because they're not as sweet as other cookies. So I will have to make these for him!